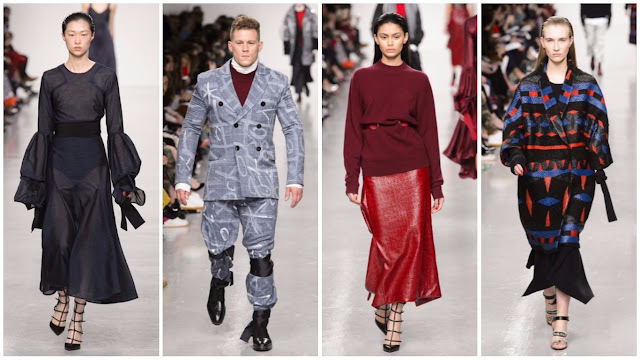 Catherine Teatum and Rob Jones, the designers behind Teatum Jones, proudly took home the International Woolmark Prize last year in a victory for the emerging label but also British fashion. They had the honour of opening London Fashion Week in February. Fresh off the success of their recent prizewinning, the designers were thinking about the body and rejecting the perfect body. (Inclusivity in fashion is battle worth fighting. In order to broadcast an image of equality, the industry has to make shifts to eradicate gender bias, prejudice against race and sexuality. The top three runway models of the previous eight months have been white. The majority of major September issue covers are fronted by white celebrities and models.) Here, the designers made a positive change to their casting that will have hopefully been potent enough for other designers to pay attention: their lineup of models included two disabled models, male models and models of colour. One hopes this isn’t a gimmick because representation isn’t a matter used solely to grab headlines—it’s a serious, important direction we must take. But as fashion designers the show cannot be about the casting, it has to be about how the inspiration informs the clothing. Their shapes were fluid and sensual, with fabrics in rich and bold hues of midnight blue, violet, mustard and an eye-catching deep rust hue. The womenswear was tinged with a bubbling sexuality, enlivened by the brand’s signature prints. Certainly, there was a German fair to the collection, perhaps influenced by the anatomically inaccurate dolls of German artist Hans Bellmer, from the 1930s, which they referenced on their mood board. To be noted, those dolls were crafted to rebuke the Nazi party’s push for physical perfection. Coupled with an extract from Meryl Streep’s Golden Globes speech in which she lambasted the asinine President Trump, denouncing his alleged mocking of a disabled journalist on his victory tour. The political prescience of the past may be repeating itself in unwelcome fashion and Teatum Jones are aware of that. Their place in the narrative is to be the voice for the marginalised communities, specifically those who aren’t the product of society’s idealised vision of physical perfection. Understandably, the strive for inclusivity garnered more headlines than the clothing. It is a shame, though. As always, Teatum and Jones made clothes worthy of our attention—the fabrication was of high quality, their colours and use of print were remarkable as ever. However, should they continue to normalise the appearance of disabled models on runways their clothing will speak for itself. Like the voice they have provided marginalised people, their volume of their clothes is loud—now all we need is to start listening.